Security will be released Tuesday, June 7th! 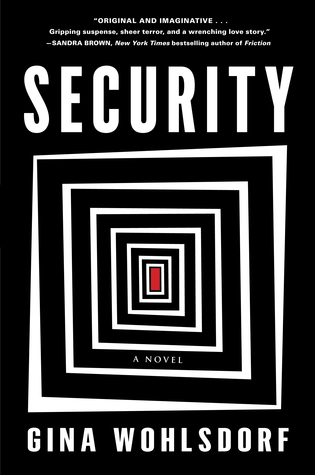 Security by Gina Wohlsdorf. Algonquin Books, 2016. 288 pages. Paperback/Softcover. I don't know if it's just been a long time since I've read an exciting, thrilling page-turner or if Security was just that good, but I was completely enraptured with this book. I started it on a Friday night and finished it Sunday evening (it probably would have been sooner, but writing papers and studying for finals interrupted by precious reading - rude). Manderley Resort is preparing itself for its grand opening day as a premier resort destination with an exceptionally intense and private security system in order to protect every one of its customer's privacy. But like any good thriller, things never go according to plan, and a killer emerges and begins to slowly pick off the staff. Our main character is Tessa, a strong-willed, hardworking woman who is the hotel manager and, essentially, the woman in charge of all preparations. She takes her job very seriously and executes everything perfectly. Underneath her rough exterior, however, lies deeper emotional ties and secrets that are known only to her, and she does her best to keep these hidden. I liked Tessa; she came across as a very logical, matter-of-fact person who doesn't really waste her time dwelling on insignificant issues or musings of the mind. However, her focus is so intent on the opening of Manderley that it seems to distract her from other issues that may be taking place - namely, the murders of her hotel staff. It was interesting to watch Tessa's character unfold throughout the story, as well as her interactions with her staff. The rest of the cast of Security all play a similar role, though each character is equipped with a firm personality to make them distinct from one another. I genuinely enjoyed the interactions that took place between each character and watching how each person reacted in the various circumstances they were placed in. Some are fighters, some are not, and some are just of along for the ride. Part of what made me love this book so much was the writing style and point of view. It takes place from one solitary point of view, but this point of view narrates from the viewpoint of various hotel security cameras throughout the hotel. For instance, one sentence you are watching Tessa talk to someone, and the next sentence the narrator has moved on to talking about what someone else is doing. It can be quite confusing if you aren't paying close attention, and this actually made me more intrigued because I was forced to focus so intently, which thus made it that much more thrilling. I also admired the way in which Wohlsdorf slowly eased us into the identity of our narrator; in the beginning, the narrator is rather vague and you almost don't realize it's first person, but as the story progresses Wohlsdorf slowly reveals more and more about our narrator through his thoughts and musings. A special little quirk involving the use of cameras as the point of view that added an extra dimension of detail was that every once in a while the page would be split into two or three columns, each detailing an event that was taking place at the same time as the other. I loved the contrasts and strict dichotomy this created between the different occurrences. I'm not too sure if this format would work out as well on an ebook, but it works wonderfully in the physical format that I read. My only form of complaint for this book is in regards to the ending. On the one hand, I'm extremely satisfied with the ending, but on the other, I'm also frustrated. I'm not sure if it was really what I expected, but overall it seems to work. It is certainly unexpected, however, and I'll leave you to find out about that yourself if you feel so inclined. Overall, I am giving Security four-and-a-half stars for its truly thrilling nature and superb storytelling.